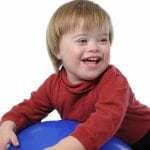 You may be asking “why us” if you have a child that is born with down syndrome. There was nothing that you did during pregnancy that could have caused this chromosomal abnormality. These abnormalities happen by chance, but become more common as eggs age. Martha and I realized that with our son Stephen, who was born with down syndrome, we developed special skills and realized that adapting to his special needs brought out the best in us. Look forward to how your special needs child will bring out the best in you as well.